Do you collect any other dolls besides Disney? Discussion in 'Other Disney Collectibles' started by Brii59, Jul 7, 2013. Just thought I would take a little poll to keep us going before the release of LE Ariel and the Fairty tale Couples...... recently I've been getting into american girl dolls, and have even been searching for a dream rush Chucky Good Guy doll ( the nice looking Chucky). Are you guys into other dolls, collectibles etc....? I have two J-Dolls (Via Appia and Promenade des Anglais). I also have a few barbies- Morgan Le Fey, I Dream of Jeannie (the original, not reproduction), Wicked Witch of the West (not sure which version, but she's got a blue flying monkey applique on her skirt), and LOTR characters (Arwen, Aaragorn, and Galadrial). I have Samantha from the American Girl dolls, but after they got rid of her and Felicity I kinda gave up on that line (seriously, the line is called American Girls and they retire the one from the Revolutionary War and their only suffragette?). I have had many different types of dolls, but right now it is just Disney, Winx, and the new Ever After High dolls. I also have some Asian Ball-Jointed dolls, though I do not collect anymore. I have owned: Blythes, Pullips, American Girls, Brass Key, Tonner, Fashion Doll Agency, Ellowyne Widle, Barbie, and probably more I cannot think of right now. Here is the thing: mainly growing up I had Disney 11 "fashion" size dolls. Then I got rid of them went through puberty, etc. I got back into dolls as a young teen because of the Anime trend, and started collecting all different types of dolls up until recently (last year or two) but none ever gave me that same feeling as looking at Disney dolls. They just take me back to a happy time and place. So I slowly cleared out my collection, I just have dolls I adore now. I do plan to expand my collection to include some mid 2000's lines. I kind of had a "childhood renaissance" when I was taking care of my sister while my mother wasn't around. We were really close and created a world with our dolls, it was how I taught her life lessons and social interaction. She was a very reserved child and couldn't always get her feeling out except by playing with dolls. In our doll world, called "Minitown" there were no mothers, and sisters raised all the kids. It is kind of funny to look back on. But I did fall in love with the dolls of the time period, including: Winx, Mew Mew Power, W.I.T.C.H, Disney Fairies (from the books), and Magical Do Re Mi. I am really excited for Evere After High because it reminds me of this style, and I usually go for new interpretations of things (esp. Winx & Disney) instead of trying to hunt down over-priced vintage dolls. I have always thought monster high dolls were adorable, but they come out with so many dolls, so quickly, that I could never keep up.... Not to mention disney dolls are expensive, well LE ones are. Honestly I have to admit I like the goty line of american girl. Kanani is my favorite doll ever from ag, also, did u know they are retiring molly this year. I'm pretty sure all the original historical will be wiped out completely eventually. That's why I got out, let's just say my most expensive doll was $1400..... and that means you only get so many dolls. I am still always so happy to see a LE doll that is amazing, has all the clothes/hair/make-up/accessories, and is under $200. Wooo Hooo! When I collected BJDs it was the ONLY thing I could collect, and it took months just to get one, not to mention saving the "fun" money for it. I much prefer dolls I can grab in a store now. If I can find some photos of my BJDs I'll post them here later. 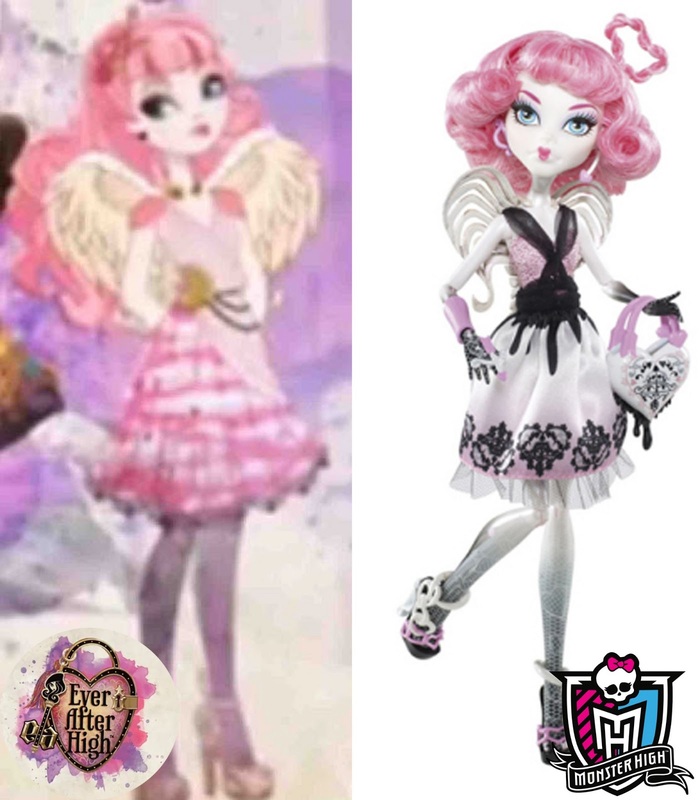 I'm in danger of becoming an Ever After High Collector 0_0 They haven't even been released yet but...Maaybe! I have one BJD doll that I have had for about 6 years. (and 4 Disney dolls) I've been very good and selective, not sure how long I can keep it up!! I'm thinking of getting one Poppy Parker doll...I have been admiring a while. I'm thinking of getting one polly parker doll...I have been admiring a while. I have one Bjd. 2 Monster High dolls (and 4 Disney dolls) I've been very good and selective, not sure how long I can keep it up! Oh my! She is beautiful, sheesh... I can't start another collection, but I CANNOT RESIST!!!! All you US collectors are lucky LOL, I bet these will be impossible to find in the UK... here's hoping for the best! I'm literally stalking every EAH page for info and sightings, can't wait until they hit the West Coast! Since getting back into collecting a few years ago the only non Disney I've acquired are 1 Barbie repro and a few Integrity dolls. Monster High collector here! Been collecting them since they first came out (I go by KraftyKitsune in that fandom) and buy all the basics/first releases of a character. I just love the details and poseability, not the mention the originality of the line. For those not too familiar with the MH dolls, did you know each character so far has had a different face mold completely? They're not like Barbie where it's the same one repainted different ways. Things like face shape, ears, noses, cheekbones, etc. are all different. And the bodies! We're talking fins, webbed hands, claws, fading limbs for a ghost, tails, scales, stitches and even a full skeleton body! And while it's not a collection due to being only one, I do have a Legolas Barbie which I love; wish I could get the other LotR dolls for a decent price. I like Wizard of Oz dolls, and I wish I could have some of the lovely Mattel Gone With the Wind dolls that have come out over the years. Especially Scarlet in the green curtain dress. The Ever After High dolls have been popping up in Justice stores here in the US. I keep telling myself, that I'll only get Maddie Hatter and Raven.....However, I like Apple White too!! It's so hard to limit myself sometimes, I feel like an addict!!! Only in the Mid-West and East Coast so far. I am DYING over here on the West Coast to get these gals. Justice is a seriously terrifying store though, all the worst things from middle school come rushing back. Yeah, I live in Texas and I've been calling Justices and they said the dolls will be out for fall....In the past, usually Texas will get the dolls, a couple weeks after the mid west and east coast. Have you seen any of the reviews done on YouTube? I LOvE the MADD Hatter so I'm very excited. My top two are Maddie and Apple right now, though I have a feeling I am going to love the Ashylnn two-pack. I've been checking the unofficial EFH FB page for sightings as well as eBay to see where the dolls are coming in. If I have to wait until fall I'll just grab them at a Target or TRU. I plan to start calling Justice once a week to check about them, I am totally obsessed! Also, with how secret and unwilling to reveal teasers Disney has been with dolls lately (I know that are saving it all for the bloody expo) I am feeling a little less excited for Disney dolls right now. You've gotta take care of your customers and give them something to dream about and look forward too. I totally agree!! I'm moving to So Cal in February to finish school and I will DEF be going to events, including the pin events at the Disney Soda Fountain shop. It's very annoying to not have the same access as the people going to the expo will.Then we are faced with having to find a decent seller who hasn't tripled the price, especially with the pins and Vinylmations. I really want the Belle and Beast vinylmation that's being sold at the expo, she's wearing her pink dress, from the snow scene.